• Click the right button to hide the palette (or palette group). • Click the left button to optimize. Figure 3-3: Mac and Windows have the same functional buttons, just on opposite sides. Almost all the Photoshop palettes have a palette menu, in which you select various options. (The Toolbox and Options bar do not have menus.) You open the palette menu by clicking the small triangle in the upper-right corner of the palette. The palette menu contains such options as thumbnail size (for example, the Layers, Channels, and Paths palettes), how to display items in the palette (Swatches, Styles, and Brushes among others), or even the size and content of the palette (Info and Histogram). When the palette is docked in the Palette Well, the triangle that opens the menu appears in the palette's tab. The content of some palettes changes automatically as you work with your image. Add a layer, and the Layers palette shows a new layer. Save a selection, and the Channels palette shows a new alpha channel. Drag a shape tool, and the Layers palette gets a new layer and the Paths palette shows the layer's vector mask. You control some other palettes by loading (and deleting) content through the palette menus or with the EditOPreset Manager command. Use the Preset Manager (as shown in Figure 3-4) to save sets of your custom bits and pieces as well as to load and delete items from the palettes. In addition to the content of the Brushes, Swatches, Styles, and Tool Presets palettes, you use the Preset Manager with a number of pickers. Pickers are sort of mini-palettes, available only with certain tools or features. The Gradient and Custom Shape pickers are accessed through the Options bar when those tools are in use. 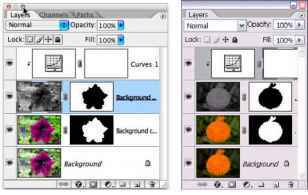 The Pattern picker is found in the Fill dialog box, the Layer Style dialog box, and (with some tools) in the Options bar. The Contour picker is used with a half-dozen of the effects in the Layer Style dialog box. When you create custom layer styles, brushes, gradients, and the like, use the Preset Manager to protect your work. Create sets of the items and save those sets with the Preset Manager. Then remember to save copies of the sets someplace on your hard drive outside the Photoshop folder so that you don't accidentally delete them if you ever (oh, no!) have to reinstall Photoshop. Remember that new content of your palettes is stored only in Photoshop's Preferences file (introduced later in this chapter) until you create and save sets. Figure 3-4: Use the Preset Manager to control the content of a number of palettes. 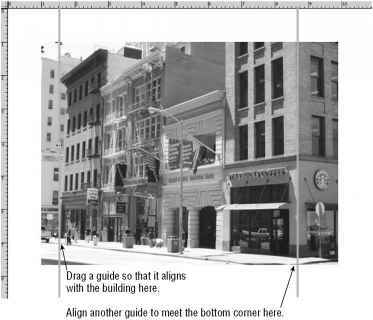 Photoshop CS2 introduces some important changes to the Layers palette, as shown in Figure 3-5. Layer sets are no more. The Link column is gone, too. Instead, Photoshop CS2 gives you the power to select multiple layers by Shift-clicking and ^-clicking/Ctrl-clicking. You can transform multiple layers, but you can't add content to multiple layers at the same time — say, filling a selection on two or three layers — nor can you apply a layer style to multiple layers all at once. You can link and create layer groups (the functional equivalent of layer sets) from selected layers through the Layers menu.